There are few better places to celebrate Christmas than in the balmy warmth and sandy shores of Hawaii. If you are heading to the islands for the holidays, brush up on a few of these essential words and phrases to use when exchanging seasons greetings with the locals. Mele Kalikimaka is the phonetic translation of "Merry Christmas" to Hawaiian. Bing Crosby released a famous Christmas song by the same name, so if you happen to forget how to say "Merry Christmas" on your vacation, just remember the song "Mele Kalikimaka." Another important phrase to remember during this gift-giving holiday is mahalo nui loa, which means "thank you very much." Whether you're treated to a meal at a Hawaiian restaurant or given a traditional island gift, saying mahalo is a great way to express your appreciation for the kindness. The Hawaiian people did not celebrate Christmas prior to the arrival of Protestant missionaries from New England who first introduced the religious holiday to the Hawaiian people. As a result, many seasonal words and phrases for which there were no clear Hawaiian language equivalents were translated phonetically. The first Hawaiian Christmas was held in 1786 when captain George Dixon was docked on the island of Kauai with the crew of his merchant ship, the Queen Charlotte. In the 1800s, the tradition was used as an offering of goodwill among men and a Thanksgiving of sorts for the Hawaiian people. The western Christmas and New Year fall during this same time of the year that the Hawaiians traditionally honored the earth for giving them plenty to eat by not allowing wars or conflicts to take place. This period of resting and feasting was called Makahiki (mah-kah-HEE- kee) and lasted for 4 months. Because makahiki also means "year", the Hawaiian phrase for "Happy New Year" became "Hau'oli (happy) Makahiki (year) Hou (new)"(how-OH-lee mah-kah-hee-kee ho). As Christmas and New Year are close together, you can even say "Mele Kalikimaka me ka Hau'oli Makahiki Hou," or "Merry Christmas and a happy New Year." Knowing these words and phrases will help you fit in with the locals on your Hawaiian winter vacation. 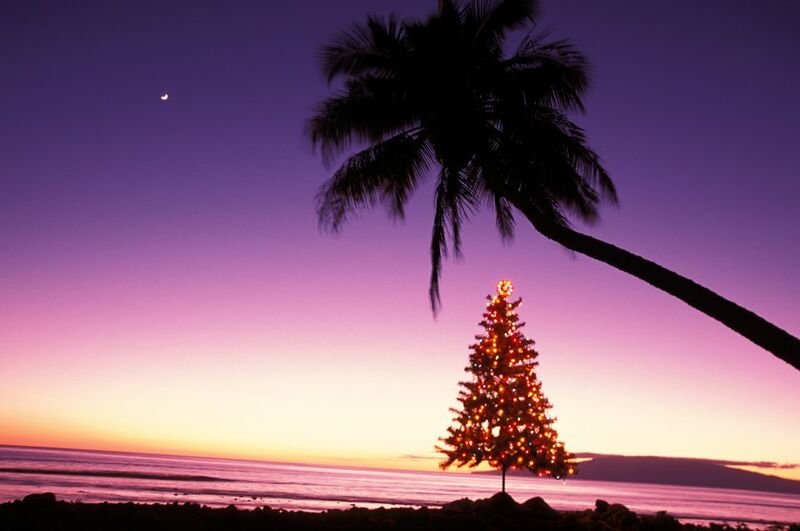 Spread the holiday cheer, wish you new friends "Mele Kalikimaka," and you're sure to enjoy your own Hawaiian Christmas. Don't miss out on the annual Honolulu City Lights ceremony at the Honolulu Hale (City Hall) if you're visiting O'ahu. Also check out some other fun festive events on nearly every other island during the holiday season, like Santa arriving by canoe or the annual Pearl Harbor Memorial Parade each December 7th.